Copyright 2005. By Janis Ringuette. Limited excerpts are permitted but please credit the author. The current Brotchie Ledge beacon stands 9.4 metres above high water. 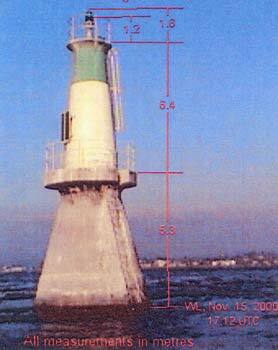 This Coast Guard photo, taken soon after the beacon was erected in 1989, shows the white cylindrical fiberglass tower topped with a green band on a concrete base. The flashing green light is run by two solar panels. The Coast Guard identifies the beacon as Brotchie Ledge Light #205, 48º 24' 24" N and 123º, 23' 11.5" W.
The first segment in this history describes the array of navigational aids installed on or near the reef during the past 162 years and explains how the reef got its name. The final segment details the spectacular shipwreck of the San Pedro and the following six year effort to refloat or remove the wreck. Brotchie Ledge was important in the early history of Victoria because everyone and everything arrived by ship. 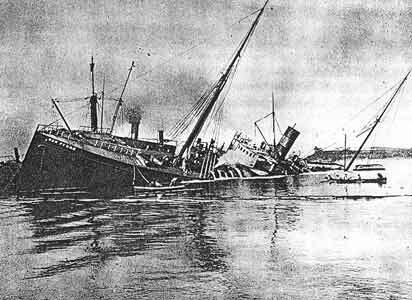 With only nine feet of water at its shallowest, the ridge was a significant danger to shipping. 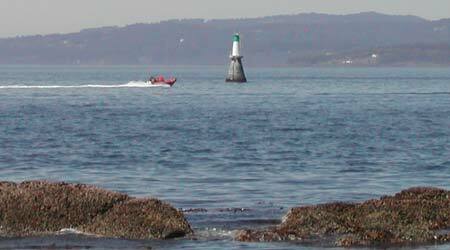 (BC Pilot, Vol I, BCGNIS) That is why Hudson’s Bay Company employees installed the first buoy on the reef--then called Buoy Rock--soon after Fort Victoria was established in 1843. The name Brotchie was misspelled in early records as “Brotchy” Ledge. The misspelling can be traced to Hudson’s Bay Company surveyor Joseph Pemberton, who wrote “Brotchy” on a 1855 map. (BCGNIS, “Geographical Names Information System, the master database for British Columbia’s place names”) Canadian Department of Marine and Fisheries continued that misspelling for decades in their Annual Reports. Brotchie attempted an unsuccessful spar business before being appointed harbour master for Vancouver Island by James Douglas in 1858. He died ten months later, on February 28, 1859, at the age of 60. Later, Dr. J. S. Helmcken described the Scotsman as “a character, genial, heavy, fat, with a twinkling humor.” (Daily Colonist, May 30, 1897, p. 7) It is often incorrectly claimed Brotchie brought the first potatoes to Victoria but James Douglas described the cultivation of potatoes by the area’s aboriginal people in 1842 (see Chapter One for details). It is likely Brotchie delivered a shipload of potatoes to Victoria, but potatoes were not new to the area. A more conspicuous and permanent beacon was planned for Brotchie Ledge but it could not be constructed until the San Pedro wreck was removed from the site. Removing the wreck proved extremely challenging and expensive. 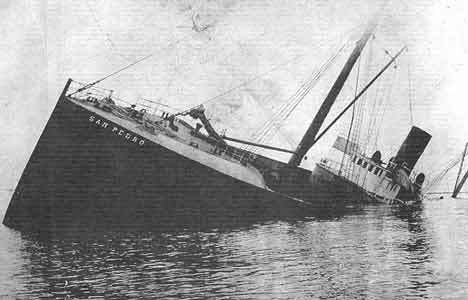 The story of the San Pedro wreck and recovery attempts is told in the last segment of this history. The anticipated electric light was not operational from 1898 to 1900. During that period, an oil lamp dimly lit the site. Using the same procedure carried out for six years when the San Pedro wreck was on the rocks, a man rowed out each evening to hang an oil lantern on the beacon instead of the old ship’s mast. Brotchy Ledge Beacon, off the entrance to Victoria harbour, built in 1898, was made more conspicuous at night by showing from a square structure with sloping sides enclosed and painted white, standing eight feet above the deck of the beacon, a light, first established in February, 1900, as a white light occulted [hidden] at short intervals. It is elevated eighteen feet above high water mark. The illuminating apparatus was a pressed glass lens. The lamp was a thirty-one day oil lamp, on the Wigham principle, which would burn without constant attendance. It was found that the automatic occulting apparatus, which was designed to be turned by the heat of the flame, did not revolve properly, and this was consequently removed and the light continued as a fixed white light until an electric cable, ordered from England, reached Victoria, in November, 1900. It was successfully laid by the crew of the Quadra in the same month, and a much more powerful fixed white light, consisting of five incandescent electric lights substituted for the oil light. In the event of temporary failure of the supply of electricity the oil light will be shown. 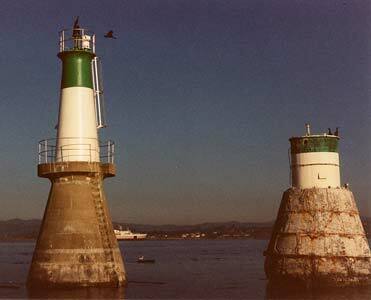 Brotchy Ledge.--On March 19, 1901, the light shown from this beacon, at the entrance to Victoria harbour, was changed from fixed white to occulting white, visible for 40 seconds and eclipsed for 20 seconds, alternately. The light is shown from a group of incandescent electric lamps. Normal maintenance apparently continued without incident and no further entries were included in Annual Reports. The Daily Colonist carried an unusual story about the beacon on July 1, 1904. A 500 pound steel elephant named Mite was stolen from a Victoria business and hung on the Brotchie beacon. At first, it was assumed it was placed on the beacon as an advertising gimmick. The business was notified by Captain Gaudin, agent of the Department of Marine and Fisheries, that it must remove its advertising from the beacon immediately or face legal action. For the next 47 years, there was no mention of the beacon in Victoria newspapers. In 1970, 72 years after it was constructed, three major changes were made on the Brotchie Ledge beacon. The light’s colour was changed from white to green, the beacon was equipped with an automatic fog detector, and, surprisingly, a windmill was installed on the beacon to power the light and horn. The black band at the top of the old beacon mentioned in this report can be seen in the photo above. Sometime before 1989, that black band was changed to green. BL LL 205 has been changed to fixed green with a high intensity green flash superimposed every 10 seconds or 6 flashes per minute. The character of the fog alarm has been permanently changed to blast 2 sec. Silence 18 sec. In addition to warning ships and boats off the rocks, the beacon serves as a prominent geographical reference point for pilots and scuba divers, fishermen, and government agencies. Brotchie Ledge is listed as a Pilot Boarding Station for ships entering the compulsory pilotage area. Diving websites and information suggest diving Brotchie Ledge to see old bottles and remains of the San Pedro shipwreck. Victoria Harbour Bird Sanctuary boundaries are marked on maps with a straight line drawn from Staines Point on Trial Island to Brotchie Ledge, then from Brotchie Ledge to Macaulay Point. Both Captain C. H. Hewitt and pilot Capt. James Christensen, Sr. were on the bridge looking for the Brotchie Ledge buoy at the time. They planned to stop at the entrance of Victoria harbour to drop off the pilot. A commission of enquiry was held into the San Pedro disaster. Captain Lewis, Captain Gaudin and Mr. Robert Ward submitted their report to the Minister of Marine and it was publicized January 23, 1892. 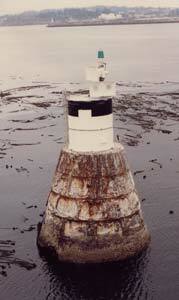 They concluded the loss of the steamer was due to “gross neglect of the pilot in not taking proper bearings by Fisguard [sic] Island light [which was visible at the time] and keeping the ship on that course.” The pilot should also have verified his position after Clover Point and observed the tide. The pilot had already been suspended for three months by the pilot commissioners. The commission concluded: “With proper care by the person in charge and existing aids to navigation, we do not consider the entrance to Victoria harbour dangerous.” However, they included a strong statement condemning the “system of pilotage that compels vessels to deviate from their course to take up or to land a pilot.” They suggested a pilot boat suitable for any weather be available in Victoria. Another great effort by Captain Whitelaw to raise the steamer came in August. The plan was succinctly summarized in the Daily Colonist: “Boiled down to a bare theory, the idea was to arrange the pontoons, tenders, tugs, wreckers, etc. so that their lifting power would be greater than the dead weight of the steamer.” Again, the ship did not budge. A confusing report appeared in the Daily Colonist later that month. According to the newspaper, Captain Whitelaw attempted to turn the effort over to the Merritt Wrecking Company of New York and a representative of Merritt, Captain J. N. Lachlan, arrived in Victoria to meet with Whitelaw August 17. Lachlan was to survey the wreck and decide if Merritt would take over the attempt to beach and repair the ship. If he took over, it was assumed Lachlan would use Whitelaw’s cribbing and pontoons, add extra bouyancy and try floating the ship again. (Daily Colonist, August 18, 1892, p. 8) It seems likely the newspaper got some facts wrong. The next year, Lachlan was identified as an employee of Southern Pacific, not Merritt, and it was said he was the original builder of the San Pedro. When those efforts were unsuccessful, Whitelaw left Victoria. In 1893, Captain J. M. Lachlan came to Victoria to take on the job of raising the San Pedro. Lachlan began work in February, 1893. He was identified by the Daily Colonist as “an officer in the Marine Department of the Southern Pacific Company,” which owned the San Pedro, “not, as many suppose, a ‘wrecker’ whose business it is to raise ships.” He was sent to Victoria by the President of Southern Pacific after Capt. Whitelaw’s efforts proved “fruitless.” The newspaper claimed Lachlan built the San Pedro and other vessels for Southern Pacific and he came armed with the ships plans. Lachlan’s initial attempt to raise the ship was made the first week of August. Just as the ship lifted “a little,” pumps broke down. The second week of August, another attempt to raise her was made with 23 pumps operating for 14 hours straight. In addition, many ships were on hand and two tugs. When the largest tug used maximum force to pull the wreck, the new rope--nineteen inches in circumference--snapped “like a piece of twine but the Pedro did not even tremble.” Lachlan recognized the ship was more damaged than previously thought. Holes 65 feet long prevented her from ever being pumped dry. Lachlan was confident his method would have worked “if she had not been damaged so much by previous efforts.” Lachlan admitted defeat. It appears Whitelaw’s arrival in Victoria was delayed. The Daily Colonist reported in February, 1897, a letter had been received from Whitelaw asking for permission to bring in his “wrecking outfit” to begin work in March. He was described once again as “the well known wrecker of San Francisco.” (Daily Colonist, February 13, 1897, p. 8) He was delayed again. 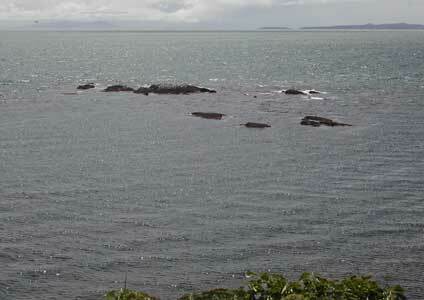 The City of Victoria dumped garbage into the ocean off Brotchie Ledge longer than Marc realized. For fifty years, from 1908 to 1958, city garbage was dumped from scows towed a short distance into the Strait by tugs. (See Clover Point History section for a full discussion). The bottles continue to be of interest to scuba divers in 2005 and are still mentioned on diving websites. In 1986, a brass plaque on granite was erected on Dallas Road at the end of Lewis Street by the Thermopylae Club to commemorate the San Pedro wreck. Glimpse Reefs lie in the Strait of Juan de Fuca very close to Victoria’s shoreline, unmarked by a buoy or other navigational aid. 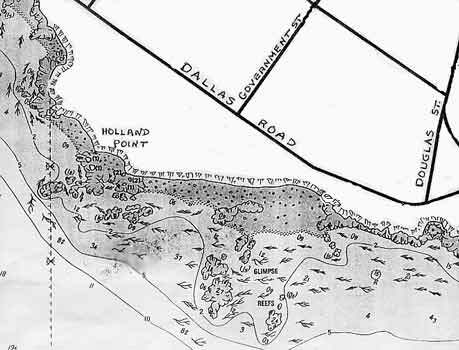 In the marine chart below, Glimpse Reefs can be seen east of Holland Point, and south of Government and Douglas Streets. 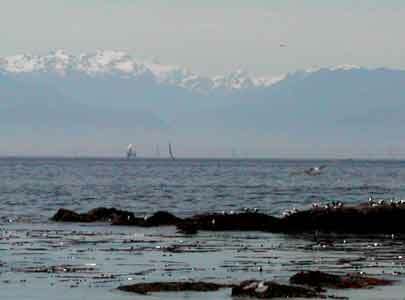 The first photo, taken from Holland Point beach, shows Glimpse Reefs in the foreground with the Olympic Mountains of Washington State visible across the Strait to the south. The appearance of Glimpse Reefs varies with the height of the tide and vantage point. 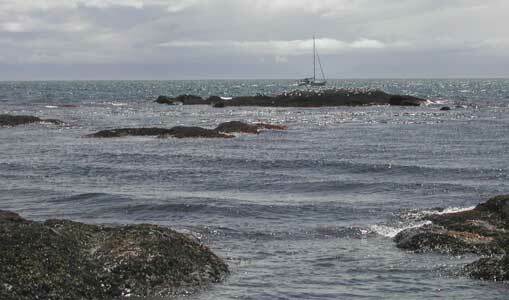 Most of the rocks are submerged at higher tides, as shown in the photo below. Walkers on the Dallas Road pathway see this view when standing on the bluff near the junction of Dallas Road and Douglas Street. This group of shallow rocks is often incorrectly described as part of Brotchie Ledge. Brotchie Ledge is much farther from shore and to the west, separated from Glimpse Reefs by one-half mile of deep water. 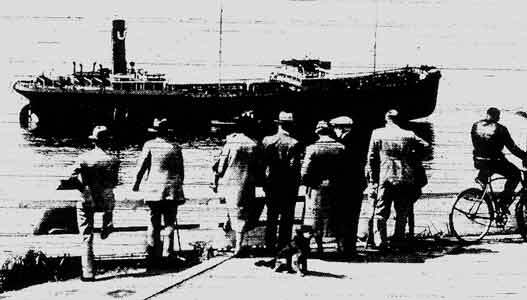 The main event in the history of Glimpse Reefs was the grounding of a large Union Oil tanker in 1938. The Santa Maria ran onto the rocks a few feet south of the Douglas Street and Dallas Road junction, providing thousands of onlookers with an astonishing sight. 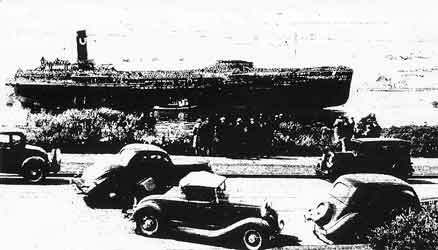 The 460 foot ship--the equivalent of a 46 story skyscraper lying on its side--was stranded “a stone’s throw” from the popular bluff pathway and busy streets. The Gonzales Observatory reported a wind velocity of 35 miles an hour between 3 and 5 a.m. but officials said the squall hitting the Santa Maria could have measured up to 50 mph. A “heavy southwesterly squall” was blamed for pushing the tanker onshore. The stranding punctured the single hull of the ship on the jagged rocks. Water flooded No. 3 tank and the port pump-room. The Santa Maria grounded as the tide was falling and remained stuck fast all day. As the tide receded, the bow rose higher and the stern settled. The Salvage King, of the Pacific Salvage Company, put a line aboard the stern of the Santa Maria. With propellers turning slowly, the tug kept the tanker from “keeling around” as she rested amidships on the rocks. To lighten the vessel for the attempt to refloat at the next high tide, fuel was pumped out and oil from that operation covered the surface of the water around the ship. There was an especially large crowd on hand to witness the effort to refloat the tanker that evening. When four tugs--the Salvage King, Snohomish, Anyox and Salvage Princess pulled with cables about 7:15 p.m., shortly before high tide, the tanker slid easily from the reef into deep water. The ship had been stranded on Glimpse Reefs for sixteen hours. Glimpse Reefs appeared in the news again after a gap of fifty-nine years. On the evening of September 1, 1994, the 38-foot power pleasure boat Grand Slam, from Seattle, ran onto the rocks and sank. Coast Guard boats rescued the six people on board. In order to avoid fuel leaks, the boat was refloated and towed to an Inner Harbour dock eight days later, under an agreement with the Coast Guard and Nick Hinskens of NHE Marine. United Engineering Ltd. lifted the boat out of the water for storage.